Is it just me who is having really bad reliability with Nauticam HDMI cables? Basically if has not worked since May, and I went back and forth with Nauticam for a couple months and am awaiting yet another cable to confirm what specific part / connection is the problem. My first problem was user error, and the screw down for external cable must have loosened as there was a touch of moisture when I disassembled after a dive. I replaced all parts to be safe and +/- 20 dives later things started acting up. There had been a 45 degree change in the plug orientation on the replacement bulkhead when installed which in my opinion caused extra strain on the cable or even the bulkead connection itself. So after a week long trip with no working monitor and weeks of email communications I got tired of inaction and had my local Nauticam deal send the 2 cables and bullkead back for testing. Nauticam USA found that the older cable didn`t work, while the brand new one was OK. The bulkhead was giving intermittent signal and all parts send to Head Office for testing. Anyway, received the parts and of course things are not working. Have tried direct connect between the camera and monitor using full-size HDMI and all is good. I do not have mini-mini connections to try alternate cable routing to see where the fault is. Am overall unimpressed with how Nauticam has handled this, and disappointed they have not lived up to their reputation for quality products and service. This is my second Nauticam housing, 3rd when the monitor was added and I honestly expected better from them. Fingers crossed the cable arrives this week so I can try to troubleshoot the issue. Next stop is a HDMI cable distributer to see if there are alternate options for the internal cable. Besides the high price on the Nauticam one, the length and way it curves inside the housing causes bad kinking. Am hoping to find a 90 degree HDMI plug and shorter cable which would allow a straight line from bulkhead to 90 degree plug. If I find a workable solution I will post part numbers. Sorry for the rant, but I did not spend thousands of dollars on a monitor system to get nickeled and dimed on faulty cables and poor service. I do not own one myself, but have spoken with several people who carry one or even two HDMI cable spares for their NA-502 monitor because of the frequency with which they seem to fail. Given all that, I am hesitant to get a nautical monitoring solution like the 502. I think the dive & sea monitors may be a much better overall choice.. I think I’ll order a spare micro to micro bulkhead also. I’ve been testing with lots of other cables and adaptors and I’m 95% sure it’s just the internal cable that’s gone. The slightest movement - ‘No signal’ flickers on the monitor. Grr. What’s annoying is it’s not all the time either, so can’t even figure out where in the cable the problem lies, reading the internet, most issues are at the connector end and poor soldiering of the terminals more than in cable issues. I think you’re right about GH5 cable being too long and having to kink it around the left drive dial to get it to fit - but looking at mine, yes it’s kinked, but the bend radius are not extreme. So surprised if that caused the issue. They should at least swap to mini not micro for the connectors. It’s just too fragile. I’m with Adam, for a hobby where the gear isn’t used day to day and I bet cared for like I do, to have it just ‘break’ for no reason the next time you come to use it, is really off putting - it makes me question, the investment and if I should just get GoPros and not worry anymore and if it breaks just buy another. This Nauticam setup I cannot. Am hoping to find a 90 degree HDMI plug and shorter cable which would allow a straight line from bulkhead to 90 degree plug. Keep me updated on this, if you find one. DiveandSee uses Mini-HDMI in their connectors. Never had any issues. Here's a method I've used to successfully modify short micro/mini HDMI cables for a monitor used with both a D7000 and a GH4 camera (mini and micro connectors respectively). It's not pretty but it works. I should mention that I'm using Ikelite housings so have a little more internal room to play with than there would be with the Nauticams. Paring back the protector sheath and bending the connector so as not to damage the fine wiring takes a little bit of patience, but the cables are only a few dollars each so you can afford the odd mishap. I find using a grinder to pare away the sheath works best. Sourcing the correct length of cable might be a little tricky, but they're probably out there. Would love a short cable as well! 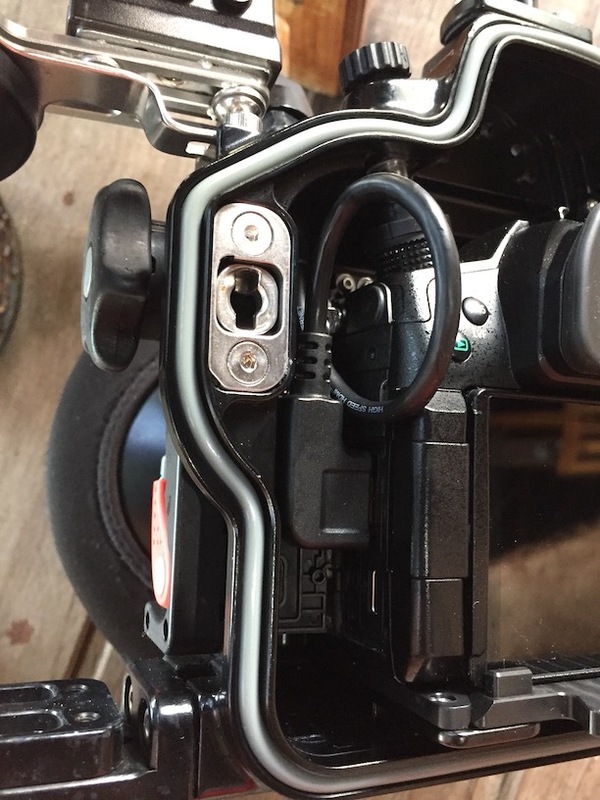 I’m using the bulkhead with extension that was required with the gh4 on my gh5 as well to not completely bend and twist the cable in the housing. According to nauticam I don’t need the extension for the gh5 but quite happy I have it. Maybe these guys can help with a cable? Perhaps a more flexible cable will put less strain on the connections. I'm waiting on my NA-502B housing (and NA cable...) to arrive, so interested in getting an additional cable as spare. Looks good. Will look into it. I wish nauticam took notice to this and just made shorter cables. I haven't had any problems with my cables yet with either the gh4 or gh5 but I always carry 3 spares just in case. A friend of mine who does this professionally told me he replaces the cables every once in a while as they eventually break. Always keep a spare or 2 with u on trips! Just found this after i ordered housing for SmallHD502 bright to pair with my nauticam GH5. Which cable should i be aware of and carry spare? camera to bulkhead? or housing to housing? or monitor to bulkhead? I would think a lot of the problem lies in keeping the cable firmly plugged into the bulkhead. The way this one is constructed with the cable coming through the bulkhead seems better but why they designed it with an a mini-mini pug inside I don't know, you woul think it's be better with just the type A plug on the end. Pity about the price being so high though! I believe its the "camera to bulkhead" cable that has caused problems, due to the tight fit, coiled cable and micro plug at the bulkhead. I've just done 3 full weeks with the Nauti GH5 and SmallHD 502Bright with no cable issues, but I have been really careful with the cable and always gently ease it into position. The battery and cards can be changed without unplugging the cable, by carefully sliding the camera outwards but not removing it from the housing completely. I have a spare cable en route just in case but so far no problems. The monitor is great by the way! Housing is bulky but fairly neutral and I can happily place it either above or behind the camera as required. Monitor housing has a single cable pre-installed from monitor, through monitor housing, to camera housing bulkhead, so there is no "housing to housing" cable. Its plenty long enough to allow gentle curves and seems robust enough. This does look like it will work? the 15cm cable with right angle hdmi to straight micro hdmi also the cable look like it can bend easier but not cheap for me to get it to Thailand. Do you mind showing the picture inside the housing with internal cable connected? I just receive the housing but realize i have to order the cable for GH5 separately. Also got me thinking why didnt nauticam reverse their standard hdmi so it doesnt have to bend down and up again just straight up. Hi, sorry I've been "out of range" in Raja Ampat. Do you still need a picture? The cable does a loop inside the housing, which allows the camera to slide out enough for battery and card change. I’d be interested in seeing that pic. So far I’ve always taken the cable out of the camera to swap batteries and memory cards. This is how I loop the cabe in the housing, and it (just about) allows me to slide the camera out enough to change battery and card. Its close to the focus zoom mechanism, but doesn't foul it. I wonder if it's the cables so much as them shifting slightly from where they're plugged into the camera? The micro/mini HDMI plugs can so easily shift out of place to the point that you lose signal.